A crowd of angry traders at the the market protest today Photo by Raymond Mayanja. Business in Natete a busy suburb on the southern outskirts of the city, today came to standstill after vendors protested the selling of land on which the market sits to a private developer. 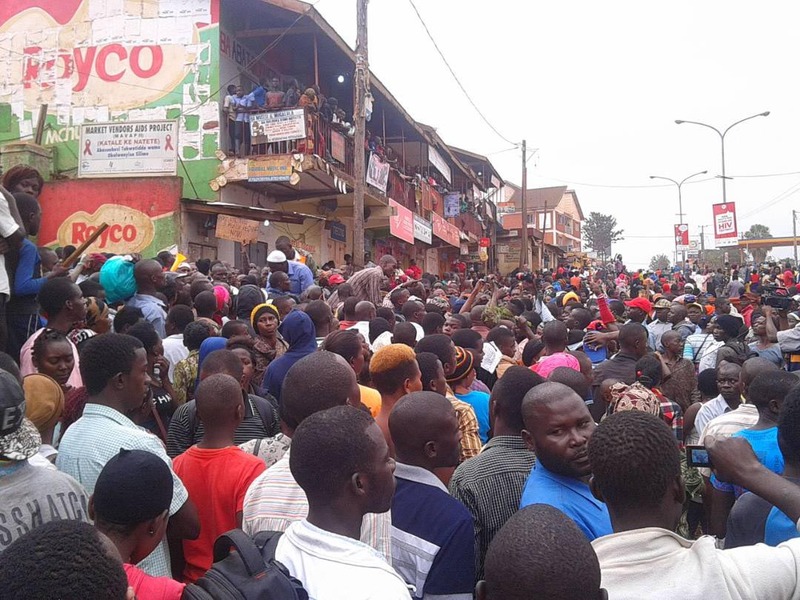 During the 9-hour demonstration, the vendors blocked vehicles from accessing the very busy Masaka Road, a key tributary into and out of Kampala from western Uganda, and beyond. Heavy early morning traffic was diverted to use the Northern By-pass. The market was developed by the defunct Kampala City Council when the late John Ssebaana Kizito was the city mayor. That investment is now threatened. Police fought running battles with angry traders, lobbing teargas canisters at the demonstrators in this usually restive enclave of Kampala given its large population of unemployed youth. Angry traders were heard accusing some KCCA officials of selling the land to RR Family Transporters Limited and pocketing the money. “This market accommodates over 10,000 vendors; where do they want us to go? We left street vending, hoping to settle in the market. We shall not vacate,”Ali Kironde, second hand cloth vendor vowed. Family Transporters Limited from the previous land owners who included Musa Ddamulira, Suleiman Nsimbe, Juma Lutwama, Madina Nassejje and Ismail Sebugwawo. In July, when the Lord Mayor Erias Lukwago visited the market, he said as the capital head, he had cancelled the taking-over of the property. He also suspended KCCA from collecting dues here until the market question was resolved. City spokesman Peter Kauju , however, seemed resigned, telling PML Daily that the land belongs to the private developer. “But our lawyers are working are around the clock to solve the situation,” he added. Last week, the Natete Market wrangles were brought to the council headed by Lukwago. The city councillors and division mayors agreed that KCCA gender and revenue directorates should team up with the legal department in court to fight against grabbing of Natete Market land. This week on Thursday, court is expected to make a ruling on the matter. The council also asked the city executive director Jennifer Musisi not to include Caleb Mugisha, a legal officer, on the team, accusing him of being a business partner of the RR company. Deputy Rubaga division mayor Asuman Ntale, during the authority meeting, read a letter Mugisha stands accused of authoring in which he admitted that the property is a possession of KCCA. At 3 p.m. today, Rubaga division mayor, Joyce Sebugwawo went to the market and she ordered all the vendors to resume business and open up their stalls. The new Auditor’s General report is revealing that owning a land title in Kampala city is no guarantee that you are safe. The report singles Kampala District Land Board officials of allocating land to more than one individual. Yusuf Nsibambi, the chairman of the land board, however, denied this claim, saying that those illegal allocations were done by his predecessors. This problem has spread to neghbouring Wakiso and Mukono districts.